This multi-purpose patch material features a special blend of refined asphalts and adhesion promoters designed to bond rapidly to moist, damp, wet or dry surfaces. It provides water repellency when conventional cements just won’t stick. 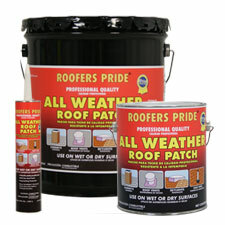 Can also be used on flashings, vents, skylights, metal joints, seams, coping and chimneys. Clean surfaces thoroughly by brooming away all dirt, dust, oil and loose particulate. Nail down any loose parts and laps. Using a trowel, spread Roofers Pride All Weather Roof Cement onto the surface at a thickness of about 1/8”, making sure to smooth down the edges. Mend cracks, splits or blisters by troweling the cement to the affected area and three inches beyond. Embed Asphalt Coated Glass Fabric into the repaired area and topcoat with another layer of roof patch material. Clean up with waterless hand cleaner immediately after use. 61415 4.75 gal. Pail 50 lbs. 61411 .9 gal. Can 9.1 lbs. 61429 10 oz. Tube .85 lbs.